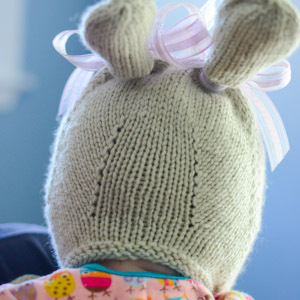 Recently I knit a bunny hat for Sonya, and it came out so cute, and so soft and fluffy, and it fits so well, that I decided to share the pattern with you! The hat is knit in the round from the brim to the crown/ears. To better mimic the natural shape of the baby’s head, the hat is worked asymmetrically, with much more fabric surrounding the face, and significant shaping at the back. The pattern is sized from newborn to 2 years old; each size uses less than 1 skein of DK-weight yarn. Read below for additional pattern details! The pattern is available for purchase through Ravelry, payment via PayPal (account not needed for either one). Sizes: Newborn (3 months, 6 months, 1 year, 2 years), to fit head circumference 13.75 (15.75, 16.75, 17.75, 18.75)”/35 (40, 42.5, 45, 47.5) cm. Finished dimensions: 10 (11, 11.25, 11.5, 12)”/26 (28, 28.5, 29.5, 30.5) cm around the face, 4.5 (5, 5.25, 5.5, 5.75)”/11.5 (12.5, 13.5, 14, 14.5) cm deep. Yarn: Rowan RYC Cashsoft Baby DK (57% extra fine merino wool, 33% microfiber, 10% cashmere), 804 pale green, 1 skein, approximately 95 (105, 110, 120, 125) yards/85 (95, 100, 110, 115) meters. Needles: US 6 (4 mm), in your choice of style for knitting small circumferences in the round, or size needed to obtain correct gauge. Gauge: 22 sts and 32 rounds = 4”/10 cm in stockinette stitch, knit in the round. Notions: stitch markers, tapestry needle, and 1 yard/1 meter of ribbon to tie around ears. Skill level: intermediate; the pattern is worked in the round and has increases and decreases. I love the hat and Sonya is one adorable bunny! So cute! I love the shaping. Absolutely darling, both baby and hat! There are two new babies in the family & they’re both be beyond adorable in this! Adding it to my Rav cart right now. That is a fine looking and well-fitting hat, and I’m going to buy it right now! I love the hat! And Sonya is so – so cute! I have to got yo the LOcal yarn shop as rowan does not have the yarn that you use. 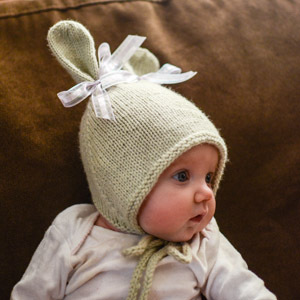 She needs to have a pic with a frowny face – as in the Disapproving Rabbit disapproves of this hat. Rowan cashsoft was discontinued in 2013. Can’t find it anywhere & have been looking for a year. Seriously bummed about this. Do you have a substitute you like? I just knit this hat for my 2-month-old son. I used some Appalachian Baby cotton sport weight bc that’s what I had (and with a little math and tweaking was able to get a similar gauge with). Because of that choice The ears are a little floppier than shown, but that’s no big deal (baby rabbits’ ears don’t stand up straight when they’re newborn anyway)! I’m impressed with the simple but clever shaping in the design—it really fits well and stays on well. Given how much babies tend to squirm and dislodge lesser hats, that makes it not just cute and fun but actually more practical than many other baby hats I’ve used on him.